Background: On October 5th General Mills announced a recall of certain lots of regular Yellow Box and Honey Nut Cheerios. According to the press release the lots impacted were produced at the facility in Lodi, California during a four-day period for Yellow Box and thirteen-day period for Honey Nut. On October 7th, Gluten Free Watchdog sent an open letter to the General Mills’ Cheerios Team regarding the recall. On October 9th General Mills responded. To view the original letter and General Mills’ response click HERE. Included below are additional questions we would like General Mills to address. Why we were led to believe they were testing all lots of finished product Cheerios (through statements such as, “As we shared with you, we conduct a minimum of 12 tests on any given sample of Cheerios”) when they were not. 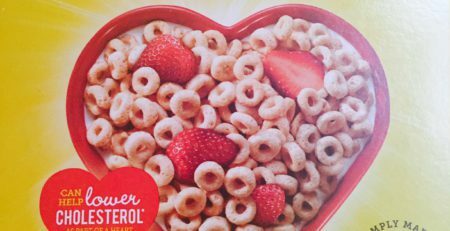 Why they continued to publicly respond to consumer reports of illness as late as September 30th by stating, “Cheerios are gluten-free and every single box & serving are < 20 ppm.” Emphasis mine. In addition, their responses to our questions are lacking in details. Additional questions that we would like to have answered are below (embedded within General Mills’ letter of response). Detailed answers from General Mills are needed before GFWD can begin the process of trusting that Cheerios are consistently and reliably gluten-free. 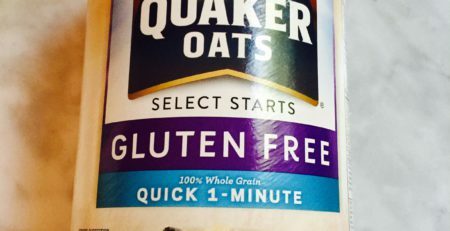 General Mills: We had tested the oat supply, and we had confirmed that it met the standard for gluten free. That has been subsequently reconfirmed. There was no issue with the oat supply. How do you know the oat supply for all labeled gluten-free Cheerios produced to date, including the oats used in the affected lots of cereal meets the standard for gluten-free? How many pounds of hulled oats (i.e., groats) are required to manufacturer one lot (one run day) of each of the 4 varieties of labeled gluten-free Cheerios? How frequently are hulled oats removed from the oats stream for testing? Do you test each individual sample of hulled oats or do you combine samples prior to testing? If you combine samples, how many different samples are included in the composite sample? How many extractions are you testing from the total amount of hulled oats used to make one lot of labeled gluten-free Cheerios? Are you using the extraction results to calculate a mean gluten level and then using the mean to determine the safety of the oats? What do you do when one or more of the extractions test high? Do you conduct additional tests on the oats or are you satisfied if the mean of all extractions is below 20 ppm? What assay are you using to test the hulled oats? Are you testing each and every supply of hulled oats used to make one lot of labeled gluten-free Cheerios? General Mills: We had also tested the oat flour prior to use, and had confirmed that our oat flour also met the FDA gluten free standard. That has also been subsequently reconfirmed. How do you know all the oat flour produced to date meets the FDA standard? How many pounds of oat flour are required to manufacture one lot of each of the four varieties of labeled gluten-free Cheerios? How frequently is a sample of oat flour pulled for testing? Do you test each individual oat flour sample or do you combine samples prior to testing? If you combine samples, how many samples are included in the composite sample? How many extractions are you testing from the total amount of oat flour used to make one lot of Cheerios? Are you using the extraction results to calculate a mean gluten level and then using the mean to determine the safety of the oat flour? What do you do when one or more of the extractions test high? Do you conduct additional tests on the oat flour or are you satisfied if the mean is below 20 ppm? What assay are you using to test the oat flour? Are you testing each and every supply of oat flour used to make one lot of labeled gluten-free Cheerios? General Mills: As your questions have consistently been focused on the oat supply, hopefully you will appreciate knowing that the oat supply was not the issue. Both the oat supply and the oat flour were tested and confirmed as meeting the gluten free standard – and both our oats and our oat flour have been subsequently retested and reconfirmed as meeting the gluten free standard. Do you have retained samples of both the hulled oats and the oat flour and are you able to trace back to the specific oats and oat flour used in a specific lot of finished product Cheerios? Note: We have concerns about the process used to test finished product Cheerios. Because we do not know General Mills’ process for testing oat grain and oat flour we do not know whether these same concerns apply. General Mills: This issue came when our Lodi facility lost rail service, and our gluten-free oat flour was off-loaded from rail cars to trucks. All current evidence points to one truck – that had previously carried wheat flour for a different customer – inadvertently introducing an amount of wheat flour into the gluten free oat flour system at our Lodi facility. That shouldn’t have happened – and we’ve acknowledged that. You state above “all current evidence points to one truck.” How confident are you that this is why certain lots of Cheerios are contaminated with gluten? How do you know that the gluten-free flour used to make the recalled Cheerios was off-loaded into a truck that had previously carried wheat flour? Do you track the specific trucks used to carry specific lots of oat flour used in specific lots of cereal? If you now know that this specific truck carried wheat flour why didn’t you know it at the time oat flour was off-loaded? Is it industry standard to inspect trucks for cleanliness prior to loading? Is your oat flour transported inside totes or is it deposited without protective covering into a rail car or truck? In your graphic that describes your testing process you write, “Our oat flour is then shipped to our cereal plants in dedicated rail cars and trucks to be made into Cheerios (emphasis mine). BUT in a statement/information attributed to Tom Forsythe, General Mills’ vice president of global communications in the Star Tribune (October 10), “Several trucks were used to transfer oat flour, and the company’s investigation is focusing on one of those vehicles. “It had hauled bread flour prior to being used by us,” Forsythe said. The trucks, operated by an independent contractor, were supposed to be thoroughly cleaned. General Mills’ own flour-handling protocols call for documentation of such cleaning, but Forsythe said the company hasn’t been able to confirm there was a “wash tag” for that particular truck.” Emphasis mine. Can you please clarify–Does General Mills use dedicated trucks to transport oat flour or non-dedicated trucks that may or may not undergo a thorough cleaning? General Mills: We’ve also acknowledged that for a number of days finished product testing was not done. We are testing finished products – and that was and had been true before this issue was discovered. But finished product was not done on these run dates, and therefore the problem was not discovered at the time of production. 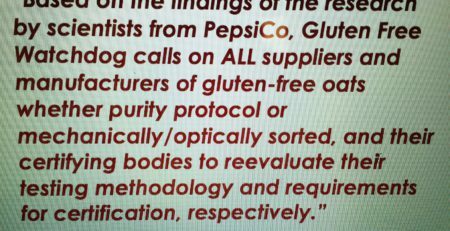 In the opinion of GFWD, not testing a “lot” of finished product is not acceptable when manufacturers are producing gluten-free food that is eaten by people with gluten-related disorders, especially those with celiac disease. Are you now testing each and every lot of labeled gluten-free Cheerios produced at all four plants? Will you continue to always test every lot of labeled gluten-free Cheerios in the future? What safeguards have been put in place to ensure that you never “stop” testing finished product? The Star Tribune article suggests that all finished product testing historically has been done at Medallion Labs but in the near future will be done at each plant. Are you planning to build labs at each of these facilities to conduct rigorous finished product testing (which as you know requires a chemical hood and well-trained laboratory personnel) or will the testing be done using inferior methods such as lateral flow (dipstick tests)? According to R-biopharm the intended use of the Rida Quick test is “as a swab test for the gluten determination on surfaces in the hygiene control and for the qualitative detection of gliadin/gluten in raw” Raw material in this case means non-processed food. Emphasis mine. It would be very helpful if General Mills provides the community with a complete list of labeled gluten-free Cheerios along with their better if used by dates that did NOT originally undergo finished product testing. This will allow consumers to make the personal choice whether to eat cereal that has not been tested. General Mills: As we’ve discussed with you in the past, we test the oat supply – and confirm that our oats meet the gluten free standard. We then mill the oats – and test the resulting oat flour to confirm that our oat flour also meets the gluten free standard. We are also testing finished products – to confirm that our finished products also meet the gluten free standard. And we had been testing finished products prior to discovering this issue. But we’ve also acknowledged that for a number of days finished product testing was not done, and therefore the problem was not discovered at the time of production. Do you have any plans to test individual boxes from every lot to supplement your lot mean testing protocol? If an individual extraction level used to determine a lot mean is at or above 20 ppm of gluten will you conduct additional follow-up testing on individual boxes to help determine the reason for the high value or will you continue to be satisfied if the mean of the 12 extractions is below 20 ppm gluten? Reminder of Gluten Free Watchdog’s recommendation when relying on lot mean testing to determine the safety of finished product Cheerios: In the opinion of Gluten Free Watchdog, if test results on a composite sample of 12 to 18 boxes of Cheerios include any values at or above 20 ppm of gluten, General Mills should explore the reason for these findings via testing of the individual boxes of Cheerios used in the composite. A result at or above 20 ppm should not be discounted as simply a random hot spot (e.g., due to an errant small fleck of barley) just because the lot mean is below 20 ppm of gluten… Because General Mills has their own lab—Medallion Labs—it should be relatively easy to implement testing of individual boxes of Cheerios to supplement their lot mean testing protocol. General Mills should be able to appreciate why there are so many questions and so much concern about their labeled gluten-free Cheerios. Cheerios made people sick, including children. And reports of illness continue to come in. General Mills should understand that celiac disease is a serious autoimmune disorder. A gluten-free diet for people with celiac disease is a medical necessity. As we discussed with General Mills in July, children with celiac disease, prior to gluten being identified as the culprit in celiac disease often presented with bloated bellies and emaciated limbs. * Many of these children died. General Mills should provide this community with the answers and transparency it deserves. As we’ve told them through this entire process, Gluten Free Watchdog is here to help. But they must be willing to listen. As an organization we will not stop fighting for the health and safety of those with gluten-related disorders. We are not going away. *If you are interested in learning about the history of celiac disease, an excellent “starter” article is “Pioneer in the gluten free diet: Willem-Karel Dicke 1905-1962, over 50 years of gluten free diet” available for free download at http://www.ncbi.nlm.nih.gov/pmc/articles/PMC1374403/ (click on full text). Tricia, thank you so much for enumerating all these questions and important points. We have been given lots of non-answers and no detailed assurances that this situation won’t keep repeating itself. If any of the testing is lot mean testing, it’s all moot to me and others who seriously need gluten free to always mean gluten free. Even if final production testing had been done on the 1.8M boxes, I wonder how many boxes that would have actually meant were tested. Per my estimation, if there were 4 days of Yellow Box Cheerios that went untested, that’s a maximum of 72 boxes that would have been tested if they say they test between 12 and 18 boxes per day/production cycle and they had tested the maximum of 18 boxes. For 13 days of Honey Nut Cheerios, if they had tested the maximum number of boxes from a lot that would have been a maximum of 234 boxes tested. So single samples (0.25 gram each) taken from 306 boxes, ground up, tested, and then mixed and tested again, and then averaged to be less than 20 ppm out of the total of 1.8M boxes of cereal was supposed to keep us safe? Perhaps my math is off, but regardless it should be clear to anyone that this kind of testing can’t possibly keep us safe. And more folks are getting ill from boxes that are not in the recall. General Mills reps continues to dismiss them and/or point the blame at them (milk intolerance, oat intolerance, etc. ), rather than fix the problem. Deplorable and criminal. Thanks, Bobby. I really appreciate all you’ve said on this matter as well. I’ve been seeing your comments in many places and I am grateful that you are speaking out for us all! Do we also need to be worried about the Betty Crocker cake mixes and Chex cereal? I’ve never noticed getting sick from the cake mixes but a year or so ago, I definitely had a reaction to one of the Chex cereals. Now, I don’t remember which one. I just decided to stop eating Chex because I think that Chex uses BHT and I thought that might be what was making me so sick. Now, with the Cheerios scandal, I’m wondering, are they as careless with the cake mixes and Chex as they have been with Cheerios? Before this situation with Cheerios I was personally comfortable with other General Mills’ products. On those rare occasions when gluten-free cupcakes are needed I use gluten-free Betty Crocker devil’s food cake mix. But my trust in General Mills is gone. I will say that every product other than Cheerios that we’ve tested to date through GFWD has tested below 5 ppm gluten. Katy, some of us have wondered the same thing. I’ve seen comments and discussions on this subject on Cheerios’ posts. I personally have gotten sick from the Chex cereals and Betty Crocker baking mixes. When this news came out on lot mean testing, it made me wonder if GM does the same testing for those products. The likelihood of those products containing gluten is far lower in the first place because there isn’t the mainstream oat issue to contend with, but if they do lot mean testing as they do for Cheerios, then we’re still dealing with a Russian roulette of gluten. Far fewer would be likely to get gluten and perhaps not the high levels present in these Cheerios, but some will. I know I have. I don’t know if we’ll ever get a definitive answer on those products as they’re not under fire, but that seems like a plausible reason for some of us getting ill from these products. I read the article and lot numbers of the recalled boxes of Honey Nut Cheerios that General Mill said were the only boxes compromised. I checked the box that made me ill and it did not match the lot numbers GM posted. The box I purchased was 20AUG2016 BU202712C. I was sick with the hour and the stomach pain last 2 days. GM is not telling the whole truth! Ellyn,I am sorry to hear that you were sick. If you haven’t already done so please contact FDA’s MedWatch at (800) 332-1088. Choose option #4 to speak with a representative. Let them know that you still have the box and can provide them with the lot number. Thank you Tricia. Well done! Thanks so much for your diligence and tenacity. Before GM recalled their product I’d stopped eating the “GF” Cheerios after reading your research. I try not to buy into conspiracy theories—but find it interesting that the Lodi Plant is getting all the blame from GM when it’s scheduled to finish closing the end of this year. It’s almost like sacrificing a dead goat. While I appreciate everything you do, it should not matter if the people getting sick are adults or children. People are getting sick. Pam, I care about everyone who gets sick from a contaminated “gluten-free” product. A friend indicated you were requesting via facebook oat producers using the gluten free purity protocol and can document it to contact you regarding compiling a list for publication. I assume you would share the list with the gluten free community. I don’t know what documentation you would need but would like for you to consider also testing the products from these producers to be certain they are gluten free and safe. Your test results would make me feel more comfortable about purchasing their oat products especially after the Cheerios scandal. Hi Jean, Yes, I reached out to manufacturers of oat-based products via Facebook and Twitter. I know all the suppliers (the folks dealing directly with the farmers) of oats grown under a purity protocol but it is not completely clear which manufacturers are actually sourcing their oats from Avena, GF Harvest, Montana Gluten-Free, etc. However, not a single manufacturer has been in touch with me. While I was hoping to approach the “oats situation” from a positive angle and promote those doing it right, I may have to approach this from the negative and shine a brighter light on more of the players sourcing oats “cleaned” via mechanical sorting. I know this is a rather late comment, but I think it’s a necessary addition for anyone new reading this thread, those who would appreciate the information, and those thinking of giving General Mills or Cheerios another chance. I recently purchased a giant size (26.6oz) box of gluten free Honey Nut Cheerios for my son. Every time I eat any of it I have a reaction due to my Celiacs within 30 minutes of ingestion. Emily, Sorry to hear this. Have you reported this information to the FDA? If not, please do. Contact FDA’s MEDWATCH, the Adverse Event Reporting System. You can do this online https://www.accessdata.fda.gov/scripts/medwatch/index.cfm?action=reporting.home or via phone (800) 332-1088. Choose option #4 to speak to a representative.